The other day after running a few errands I popped into my local Goodwill. I did my usual quick pass through my favorite sections and came up empty handed until I saw a tiny wood chest of drawers. At just 5.5″ tall, I thought it might be dollhouse furniture. Dollhouse chest of drawers found in a thrift store. 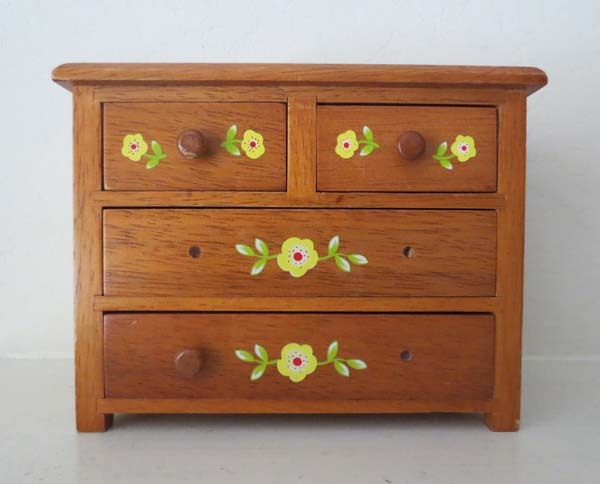 It was kinda cute with painted/stenciled flowers, but missing three little knobs. Well, that’s no good. That would never sell and I started walking away. Then I stopped, went back and picked it up. It was surprisingly heavy and made of solid wood (possibly oak) except for the bottom of the drawers (particle board). And while it wasn’t a superior piece of craftsmanship, it wasn’t bad either. For $3.79…okay…maybe I can do something with this. But not being a DIY person, I’m feeling a bit challenged! My first thought was just to find replacement knobs, but the chances of finding perfect matches in size and color seemed remote. 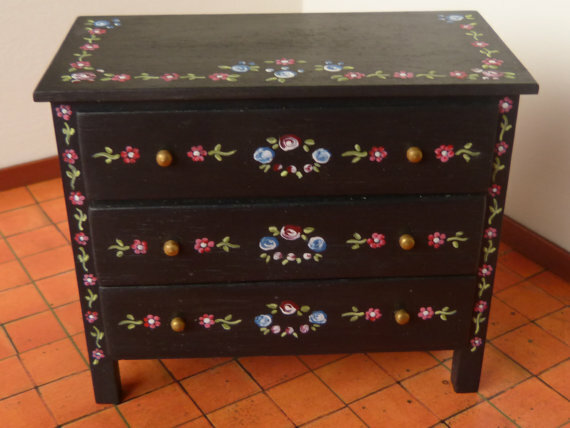 Then I thought I could replace all the knobs, maybe with painted versions picking up a color from the flowers. Then an uncharacteristic thought occurred to me…why don’t a switch it up totally? Sand off the flowers, give it a black wash finish (still letting the wood grain show through) and use some small crystals as knobs. Make it a bit glam. Turn it into a jewelry box. Or if I had the skill turn it into something like this beauty from Etsy seller Miniatures Forever. From Etsy seller Miniatures Forever. But one of the problems with my find is that that drawers can’t be removed. (I’ve tried, believe me!) So refinishing or painting it will be tricky. Rats! So DIY friends, what would you do with my thrift store dollhouse chest of drawers? perhaps someone would go for it that way….on the other hand if you want to spend a couple day refinishing, then your idea sounds nice, but what does the other one sell for?